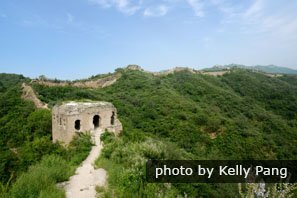 The Great Wall at Gubeikou was built along a mountain range, rising and falling. An important Great Wall pass, it retains its original bricks and stones from two separate dynasties, well-preserved and unrestored. Northern Qi Dynasty: The earliest Great Wall construction began in 556 during the Northern Qi Dynasty, but it was built with dirt and stone, and it&apos;s not well preserved. The best preserved watchtower of the Northern Qi Great Wall there is &apos;Big Flower Tower&apos; (Dahualou). Ming Dynasty: After about 800 years, in the Ming Dynasty (1368–1644), the Gubeikou Great Wall was extended and enhanced with more beacon towers and pass gates. The last construction took place in 1567. No rebuilding or renovation was done since then. This section is built along the Yan Mountains, and the Chao River, where the town of Gubeikou is, divides it into two distinct parts. It was a key pass between ancient China and Mongol territory. It protected ancient China from Mongol/Manchu invasion from the north. Gubeikou&apos;s Great Wall retains its original composition. It&apos;s a wild Great Wall section. The scenery is not as spectacular as at Jinshanling or Simatai. But this section is perhaps more interesting historically. 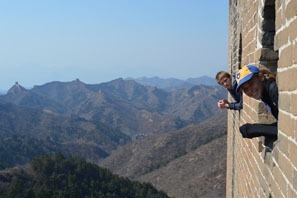 The Wohushan length of Great Wall is 4.8 km (3 mi) long, west of Gubeikou Town. The highlight of Wohushan are the &apos;Sister Towers&apos; (姐妹楼 Jiěmèilóu /jyeah-may-loh/), two watchtowers that stand close to each other. At the river side, these two towers look like two sisters standing by the river hand in hand. The Panlongshan part of Gubeikou&apos;s Great Wall is about 5 km long, east of Gubeikou Town. Panlongshan was once said to include Jinshanling and Simatai West. General Tower and 24-Eye Tower are the highlights of the Panlongshan Wall. 24-Eye Tower (二十四眼楼 Èrshísìyǎnlóu /err-shrr-srr-yen-loh/) had 24 observation windows, six on each side, which was rarely seen at other sections. But only the west and south walls remain. 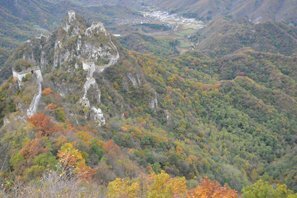 Hikers continue from there to the Jinshanling section, as it at the east end of Gubeikou, where it meets Jinshanling at Longyukou (龙裕口 Lóngyùkǒu /long-yoo-koh/ &apos;Dragon Abundance Pass&apos;). 24-Eye Tower is about the 20th (relatively intact) tower on Gubeikou East, and the highest at over 400m altitude, presiding over Longyukou pass. The first 2 km of Gubeikou&apos;s wall from the town has virtually no towers standing. There is no direct transport from Beijing to Gubeikou. You could take a Beijing–Chengde train (e.g. K7717) to Miyunbei Station. Then take town bus 密6 to Dongcaiyuan Xiaoqu (东菜园小区). Walk to 300m east to Changcheng Huandao (&apos;Great Wall Traffic Island&apos;), south then southeast 150m, keeping on the right side of the road and taking the first exit from the traffic island. There you&apos;ll find a stop with bus 密25 to Gubeikou station. 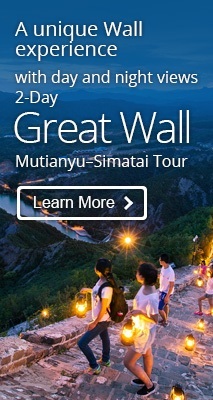 Or take bus 980 from Dongzhimen Station to Miyun Station, then Miyun bus 密25 to Gubeikou. Tour Gubeikou with China Highlights. There are lots of challenges and inconvenience with self travel, especially if you don&apos;t know these areas well. A private tour, with experienced tour guide and driver, will mean you won&apos;t have to waste time on transport, getting lost, or worrying about emergencies. We offer a one-to-one tour guide service, where one tour guide is responsible for one tourist&apos;s safety, if needed. 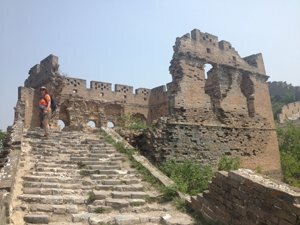 If you are interested in hiking more of the wild Great Wall, please see our 5-Day Discovery Great Wall Hiking from Jiankou to Gubeikou. 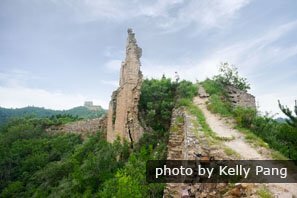 This tour contains the three top wild Great Wall sections around Beijing: Jiankou (the steepest section), Gubeikou, and Mutianyu. Not interested in the above tour? 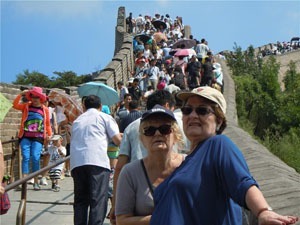 See more Great Wall Hiking Tours or just tell us your requirements and we will design a Gubeikou tour for you. 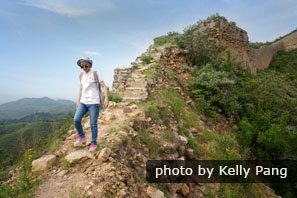 Hiking at Gubeikou is moderate, with some steep steps and uneven surfaces. There are no cable cars or surfaced paths. Hikers should climb with companions, and should avoid climbing under bad weather conditions, such as rain and thunderstorms. Wear/bring sun protection in the summer and dress for sub zero temperatures in the winter. It can feel much colder on the wall than down in the valleys because of altitude and exposure. Bring breathable waterproofs for protection from rain and wind. Umbrellas may be used here as the ascents and descents are not difficult, but may be inconvenient in strong winds. Bring a camera and money for souvenirs and refreshments. Bring snacks and water if you want to walk a long portion of the wall. 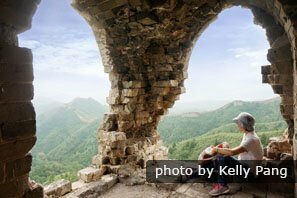 Jinshanling&apos;s Great Wall Section, east of Gubeikou, has the most beautiful Great Wall scenery and is well worth a visit. 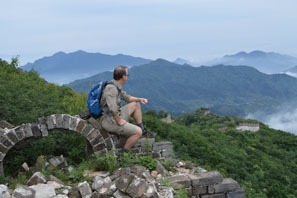 Jiankou&apos;s Great Wall, the steepest section, has a challenging hike to splendidly restored Mutianyu. 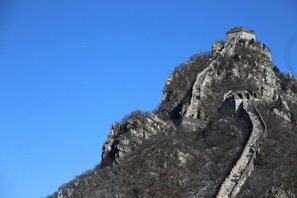 If you want to see more of the Great Wall near Beijing, see here for a list of the sections.